A newborn’s blood is spotted onto a Guthrie card. Commonly used to collect blood spots from the pricked heel of newborns to screen for diseases such as phenylketonuria, cystic fibrosis, and sickle cells disorders, Guthrie cards might offer a snapshot of the epigenome before disease develops. 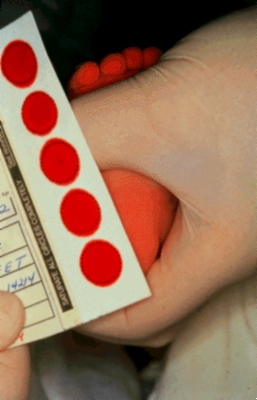 Photo: The New York State Department of Health Newborn Screening Program.